Massive turnout for Bernie Sanders in Denver: Is he Gaining on Hillary Clinton? 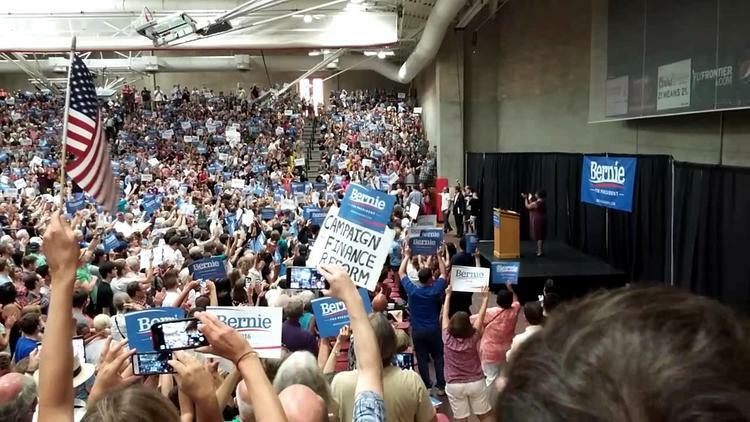 At least 5,500 Coloradans crammed into a Denver gymnasium, an adjacent atrium, and lacrosse field Saturday night to hear presidential candidate and Vermont Senator Bernie Sanders speak, in what is being reported as one of the biggest political rallies so far in the 2016 election cycle. Saturday’s crowd is the latest sign that Sanders is proving a real challenge to former Secretary of State Hillary Clinton, whose rally at New York City’s Roosevelt Island last week drew an estimated 5,500 people. Sanders has been drawing large crowds, from Vermont to Minneapolis, and numerous polls show that Sanders is gaining on Clinton, including recent surveys of the battleground state of New Hampshire.